How influential is Apple? Its products dominate the conversation, even when talk turns to every PC released in the last quarter century. To celebrate the 25th anniversary of the IBM’s first PC— IBM Personal Computer, Model 5150 —our colleagues at PC World ranked the 25 greatest computers of all time. Their criteria included four factors—innovation, impact, industrial design, and intangibles. And not surprisingly, Apple offerings made an impressive showing, with products out of Cupertino grabbing five of the top 25 slots—including PC World ’s choice for the No. 1 greatest computer of all time, the Apple II. We’re excerpting PC World ’s Apple selections below. You can find the complete list of choices at PC World’s Web site; you can also look at the systems that nearly made the cut from 1983 and earlier, 1984 to 1989, and the last dozen years. Not to give anything away, but more than a few Apple-built computers made those lists, too. The Apple II wasn’t the first personal computer, or the most advanced one, or even the best-selling model of its age. But in many ways it was The Machine That Changed Everything. On all four of our criteria, it was such a huge winner that it ended up as our Greatest PC of All Time. The 8-bit system came with 4KB of memory, expandable to 48KB. It used a cassette rather than a disk for storage. It cost $1,200, about twice the base price of its two biggest competitors, the Tandy TRS-80 Model I and the Commodore PET 2001. It couldn’t even display lowercase letters (in the first several years of its existence, anyway). Yet it packed more pure innovation than any other early computer, and was the first PC that deserved to be called a consumer electronics device. Born out of the Home Brew Computer Club by Steve Wozniak and Steve Jobs’s tiny Apple Computer in 1977, the Apple II was the company’s second PC, but it boasted more than its share of firsts: It was the first color PC (you could even use it with a television), the first to be easily expandable by users, and the first to run the VisiCalc spreadsheet—proving that these new boxes had a place in business. Perhaps its greatest innovation was its design. Jobs wanted the machine to look at home on people’s desktops, so he insisted that the Apple II have a sleek look, as opposed to the sheet-metal-and-exposed-wire appearance of most other early PCs. The machine’s coolness factor—an Apple trademark to this day—was as important to its long-term success as Wozniak’s inventive engineering was. And we do mean long-term: From the original Apple II model that debuted at the first West Coast Computer Faire in April 1977 to the discontinuation of the final iteration of the IIe in December 1993 (outlasting the 16-bit IIGS model that was introduced years after it), more than 2 million Apple II-family PCs had been produced. The Apple II line, well documented at Steven Weyhrich’s Apple II History site, kept the company going through the Apple Lisa debacle and other turbulent events of the 1980s. By the middle of that decade, though, Apple had turned its attention to that other world-beater, the Macintosh Plus. But it was the Apple II that put the personal in the nascent personal computer industry. The rest is history. In 1984 Apple released the original Macintosh, which, while heavily influenced by the Xerox Star, was a breakthrough personal computer. But its 128KB of memory was so skimpy that the machine was virtually unusable. The company really hit the ball out of the park in 1986 with the Macintosh Plus (see the specs of this Apple model and others at Apple-History.com ). The $2,599 Mac Plus had the same Motorola 68000 processor as the original Mac, but it came with a roomy 1MB of RAM and was upgradeable to 4MB of RAM. It supported the brand-new 800KB double-sided floppy-disk format, and was the first Mac with a SCSI port for fast data transfer to and from an external hard drive. Like earlier Macs, its cute beige all-in-one case housed a monochrome 512-by-342-pixel display and the 3.5-inch floppy drive. It also came with matching beige input devices: a sturdy keyboard with a numeric keypad connected by a coiled cord, and a boxy, rectangular mouse. Apple sold the Mac Plus until 1990, making it the longest-selling Mac model ever. By then it had received cult notoriety via a cameo in the movie Star Trek IV: The Voyage Home. Today, working Mac Plus models sell on eBay for about $25. Nonworking models have found an entirely different afterlife: They’ve been reincarnated as fish tanks. If your first portable computer doesn’t succeed, try, try again. That’s the lesson of the PowerBook 100, Apple’s splendid successor to the famously awful Mac Portable, a machine we named to our list of the 25 worst tech products of all time. Along with the higher-end PowerBook 140 and 170, the $2,500 100 sported two features that the rest of the industry quickly cribbed. First, the company pushed the keyboard back toward the screen hinge, freeing up space for a wrist-rest area that made typing more comfortable. And in the center of that wrist rest sat a nice, large trackball, the best mobile pointing device of its era. (At the time, folks who ran Windows on portable computers were still futzing with unwieldy clip-on trackballs.) Those were just two of the more striking innovations in a slick laptop design that, according to Jim Carlton’s book Apple , took the company from last place to first in laptop sales. 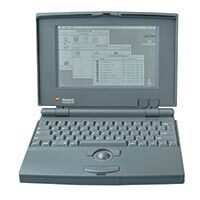 The PowerBook 100—which was, by the way, manufactured by Sony—was discontinued in 1992. But the PowerBook line went on and on, coming to an end just this year, when the final 12-inch PowerBook was replaced by the MacBook. The first-generation iMac of 1997 may have been the machine that told the world that Apple, and its recently returned cofounder Steve Jobs, were back. But its second-generation successor was a vastly different, far more inventive computer. And even though it didn’t turn out to be an influential one, it remains a high point in PC design history. With its dome-shaped base and its flat-panel screen that “floated” on a swivel arm, this iMac was, quite literally, like no computer that came before it. It had a friendly, anthropomorphic feel, in part because it bore a spiritual resemblance to Luxo Jr., the plucky desk-lamp hero of the Oscar-winning short film from Pixar, Steve Jobs’s other company. The design looked cool, saved space, and provided near-infinite adjustability for the display. But it didn’t last long: In 2004 the second-gen iMac was replaced by yet another all-new model, which squeezed the entire computer into the back of the flat-panel monitor. That elegant design is probably more practical than its lamp-like predecessor, but it lacks the older machine’s whimsical exuberance. Over the past three decades, Apple has released a bunch of great PCs that had a huge impact on the marketplace. Here’s one that had almost no impact during its short life—aside from its cameo in the film Batman & Robin as Batgirl’s PC—but we love it anyway. The $799 eMate was idiosyncratic in virtually every way a computer can be idiosyncratic, starting with its target audience: schoolkids. It ran an operating system designed for PDAs (Apple’s Newton OS). It didn’t have a hard drive, but it did have pen input. It looked vaguely like a notebook, but its industrial design—with a green, curvy case that looked like it had sprung from the mind of science-fiction illustrator H.R. Giger —was utterly unique. The eMate attracted a cult audience among business users. But Steve Jobs, who returned to Apple soon after its launch, wasn’t a believer: Less than a year after the eMate shipped, he killed it, along with the rest of the Newton line. The cult continues, though—you can even find hacks to overclock the eMate at Stephanie’s Newton Web Site.